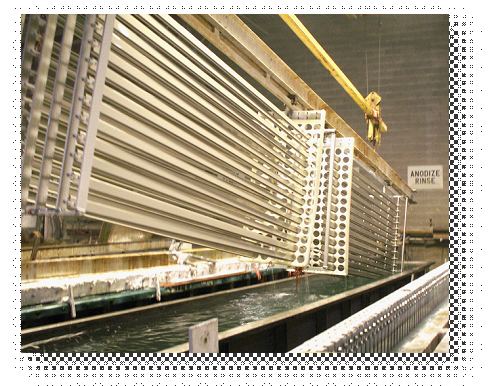 Anodizing is an electrolytic passivation process used to increase the thickness of the natural oxide layer on the surface of metal parts. 1. Cleaning - removes fabrication oils and buffing compounds by soaking the work in a water-based solution containing mild acids or alkalis along with dispersants and detergents. 2. 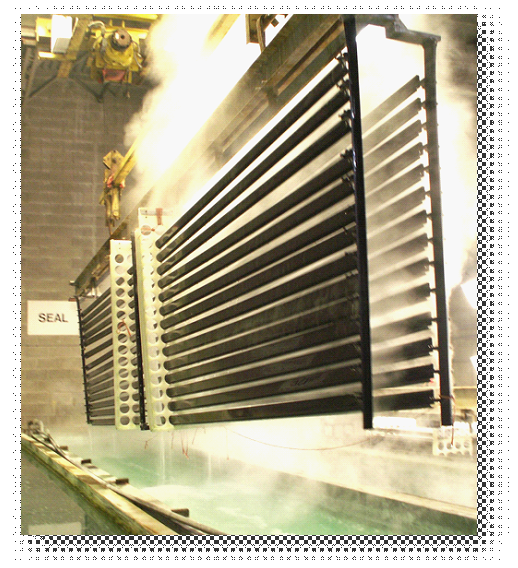 Pretreatment - used for decorative purposes to improve the appearance of a surface prior to the anodizing step. The most common pretreatments are etch, which imparts a satin, matte finish; and bright dip, which impart a bright, shiny finish. 3. 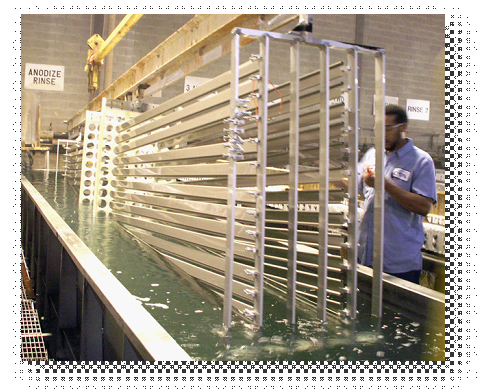 Anodizing - produces the actual coating. 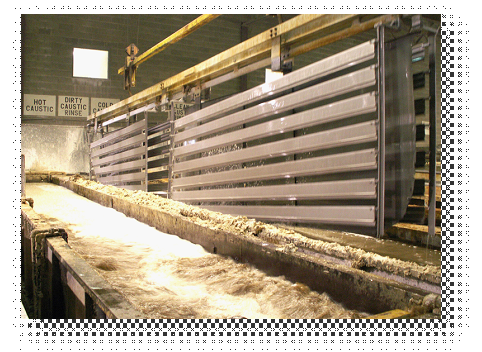 Acting as the positive electrode, a direct current is passed through the item to be anodized while submerged in a bath of water and acid (sulfuric, chromic, phosphoric) used as the electrolyte. 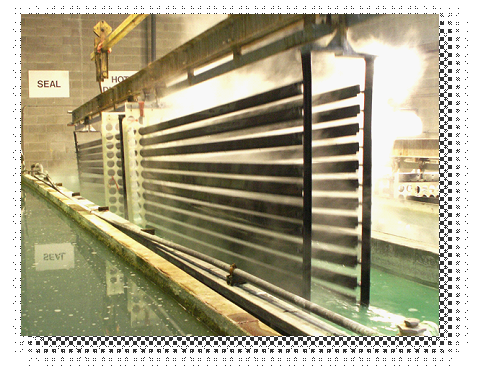 1) Integral Coloring - imparts color to the coating as it is being formed in the anodizing bath, which has been modified for that purpose. 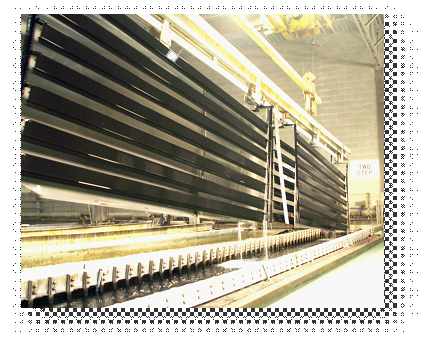 This process produces various brass, bronze and black colors, while providing a more abrasion resistant coating than conventional anodizing. It is the most expensive process since it requires significantly more electrical power. 2) Electrolytic Coloring - imparts color to the coating after it is formed and takes advantage of the fact that the freshly anodized coating is porous and therefore capable of absorbing colorants. 5. Sealing - the pores on the surface of the finished pieces need to be closed before the anodized item is placed into service. If left unsealed, surfaces could have poor corrosion resistance, or absorb unwanted stains. Items that are not colored during or after anodizing retain the natural color of the metal. Anodized is considered environmentally safe, producing few, if any, harmful effects on land, air, or water. 1. Protects satellites from the harsh environment of space. 2. Provides attractive, minimum-maintenance, highly durable exteriors, roofs, curtain walls, ceilings, floors, escalators, lobbies and staircases in skyscrapers and commercial buildings throughout the world. 3. Revolutionized the construction of computer hardware, exhibit displays for trade shows, scientific instruments, and a constantly expanding array of home appliances, consumer products, and building materials. XY-Global,designing and manufacturing custom made parts,are the leading manufacture that enables any company, organization,or individual to design, price and instantly order machanical parts. Here is our website : www.diecastingpartsupplier.com .